Covered with tough plates and sporting a sharp crown of leaves, pineapples hide their treasure of golden fruit well. But chopping a pineapple down to size isn’t as difficult as it looks! 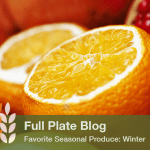 Start with a ripe fruit and this blog post. The tall, yellow fruit that typically comes to mind when you think of a pineapple are called “smooth Cayennes.” They are grown in Hawaii and are in season and in your grocery story during these spring months. There is also a short and reddish variety known as the Red Spanish pineapple, which are grown in Florida and Puerto Rico. To identify a ripe, ready-to-eat pineapple, look for a large, plump fruit that’s slightly soft to the touch. When you press on a pineapple, it should have just a little bit of give; if the pineapple is overripe, it will have skin that is soft or dark in areas. A ripe pineapple’s leaves should be dark green and crisp; if the leaves are yellow or brown-tipped, it is past its prime. An uncut pineapple, tightly wrapped, will stay fresh in the fridge for three days. Once cut, the fruit can be stored in the fridge for another three days. 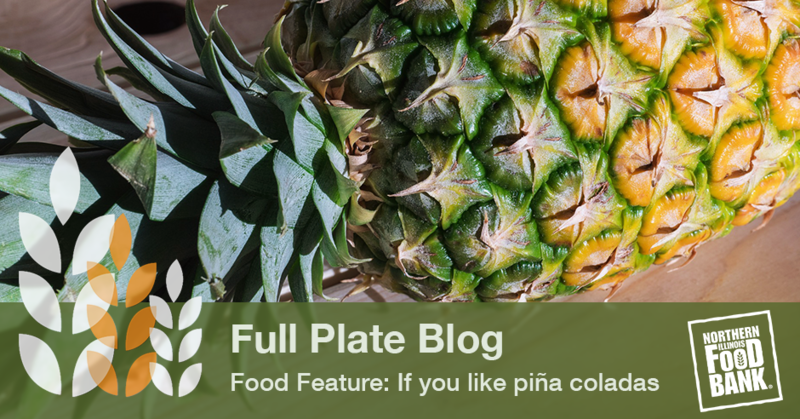 With its thorny exterior and hefty size, getting to the fruit of a pineapple can be daunting. With a sharp, equally hefty knife, you can make quick work of this tropical treat. Watch this video for a step-by-step guide on how to cut a pineapple into chunks or rings. Pineapples are a great source of vitamin C, which is known to protect against heart disease, cancer, and cataracts. An enzyme in the fruit helps relieve indigestion, and the manganese in pineapples is good for bone strength. Not to mention that – morning, noon, or night – pineapples add a bright flavor and look to your favorite meals. Pineapples can be eaten raw, added to fruit salads, desserts, or even meals with meat and vegetables. Grill it, sauté it, broil it – get creative with this tangy fruit! When cut up into chunks, a medium-sized pineapple equals about three cups of fruit. Stir small chunks of pineapple and chopped pecans into Greek yogurt for a protein-pack breakfast. For lunch or dinner, add pineapple to your favorite stir-fry recipe – complete with snow peas, broccoli, carrots, and mushrooms – and serve over rice. Save some pineapple to stir into cottage cheese for a quick snack that’s sweet and salty. Have you ever thought of baking with pineapple? Think beyond pineapple upside-down cake and try these healthy pineapple muffins – a quick and easy breakfast for the whole family! Find the recipe here. What’s your favorite way to eat pineapple? How do you get creative with this tropical fruit? Let us know on Facebook! (1) Reid, Su. “In Season: Pineapple.” Cooking Light. Cooking Light, 29 Mar. 2016. Web. 06 Apr. 2017. (2) “How to Cut Pineapple.” YouTube. Allrecipes, 03 May 2011. Web. 06 Apr. 2017. (3) “Spring Is Here – Grocery Shop for the Season!” American Diabetes Association. MyFoodAdvisor, n.d. Web. 06 Apr. 2017. (4) “Pineapple Flax Gluten-Free Muffins.” American Diabetes Association. MyFoodAdvisor, n.d. Web. 06 Apr. 2017.